Canon India Pvt. Ltd stepped into a new domain with the launch of a range of wireless Laser Presenters. The firm launched four models of wireless laser presenters, including PR1000-R, PR500-R, PR100-R and PR10-G. 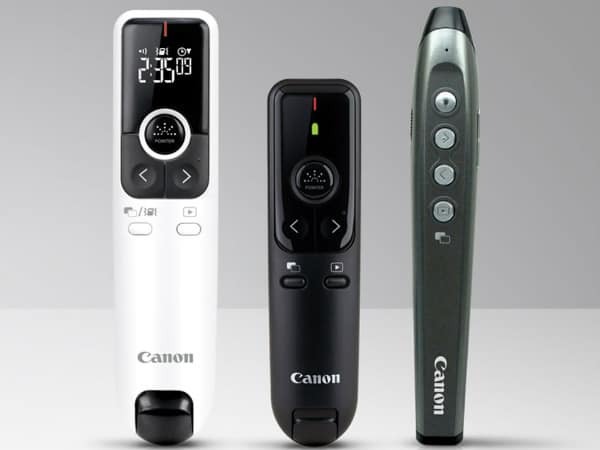 Compatible with PowerPoint and Key Note**, the presenters provide wireless slide operation via a USB plug-in receiver. Requiring no setup, users can ‘plug and play’ and use the presenters instantly. ** PR1000-R supports Keynote on next slide and previous slide functions only. The flagship model PR-10G features high intensity green laser which is 8X more visible than conventional laser pointers and has a wireless range up-to 100 feet. PR100-R and PR500-R features high intensity red laser with double the intensity than conventional laser pointers. PR1000-R, PR500-R, PR100-R and PR 10-G are priced at INR 3995, 4495, 5,695 and 6,995 respectively. Starting May 01, 2017, they are available for sale, accompanied by a 1 year limited carry-in warranty.